Cox Communications is the fourth largest cable-television provider in the United States, serving approximately 6.3 million customers. A Fortune 500 company, Cox has built communications networks and delivered quality cable television programs since 1962. Cox is noted for its high-capacity, reliable broadband delivery network as well as the company�s ability to provide superior customer service. For Cox, it�s not about being the biggest; it�s about being the best. 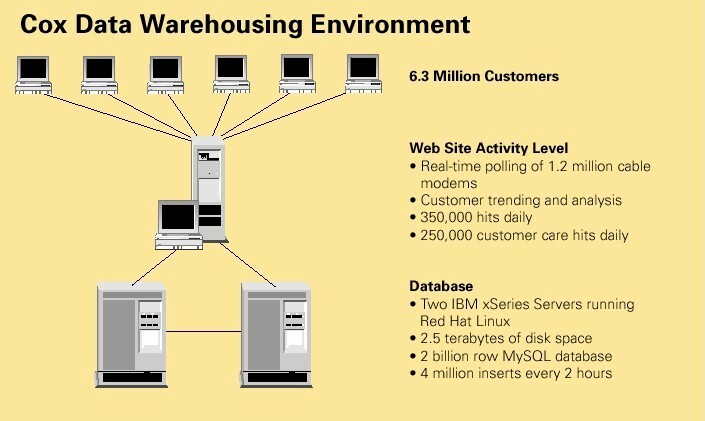 To maintain optimum performance and customer-service levels, Cox has developed a huge data warehousing application. At the heart of this business-critical system is a 2-billion row MySQL database. Cox uses the MySQL database to manage a variety of cable modem information, maintain cable firmware, provide an interface to customer care for real-time support and expedite internal and customer trending and analysis. Additionally, the database aggregates the company's scheduled polls and mines the data for pertinent trouble-identification metrics on its RF (coaxial) plant. Given the size and complexity of the application, the MySQL database is under constant pressure to perform. 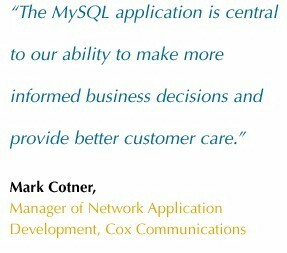 On a daily basis, Cox uses MySQL to pull data from over 1.2 million cable modems. Already the database includes more than 3,600 tables and two billion rows of data. Overall, the MySQL database handles approximately four million inserts every two hours. Data analysis with MySQL is fast, dealing with the latest up-to-date information. 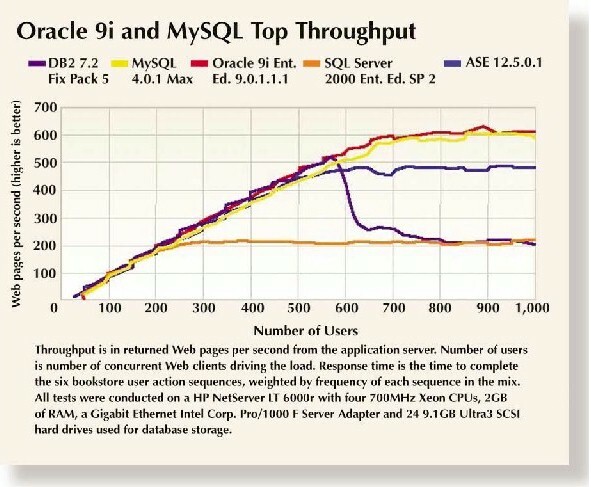 MySQL is unmatched in speed, compactness, stability, and ease of deployment. (See the throughput comparisons in Figure 1.) When used in a data warehousing application, MySQL provides greater operational understanding of customers purchase habits and service needs enabling more effective sales and better service. While MySQL has proven that it is able to easily handle Cox's large-scale, high-volume warehouse application, it has also enabled Cox to achieve an extremely low total cost of ownership. Cox uses the LAMP software stack, with Linux, Apache, MySQL, PHP and Perl. The poller application is written in Perl and they also use Perl to collect data from the pollers and store it in the master MySQL database. The application has a Web-based front-end written in PHP, which enables reporting and real-time polling features. The Cox technical environment includes IBM xSeries servers running Red Hat Linux. Two Linux boxes with 2.5 terabytes of disk space in a high avail-ability configuration serve all of their high speed Internet customer care account lookups and real-time modem polling (approximately 100, 000 hits a day). They also aggregate Cox's scheduled polls and mine that data for pertinent trouble identification metrics on its coaxial plant. MySQL has been proven in the market place with over four million active installations. MySQL AB stands behind the software with 7 x 24 support, training, certification, and consulting. The MySQL database is supported by MySQL AB, a second generation Open Source company founded in 1995. The company is profitable, owns and supports all its own code and offers a unique licensing approach that makes corporate purchasing easy. MySQL AB develops and supports a family of high-performance, affordable database products. The company's flagship offering is 'MySQL Enterprise', a comprehensive set of production-tested software, proactive monitoring tools, and premium support services. MySQL is the world's most popular open source database software, with over 10 million active installations. Many of the world's largest and fastest-growing organizations use MySQL to save time and money powering their high-volume Web sites, business-critical systems and packaged software -- including industry leaders such as Yahoo!, Alcatel, The Associated Press, Suzuki and NASA. With headquarters in the United States and Sweden -- and operations around the world -- MySQL AB supports both open source values and corporate customers' needs in a profitable, sustainable business model. For more information about MySQL, please visit www.mysql.com. What is the purpose of the data warehouse at Cox Communications? What are the LAMP technologies? What are the advantages and disadvantages of using open source technologies for decision support? How does management know which vendor to select? Do you think it is difficult to change vendors? Why or why not? What are the key IS/T challenges in cable TV? Today? Five years from now? MySQL Staff, "Cox Communications powers massive data warehouse with MySQL", March 23, 2007 at URL DSSResources.COM. Lisa Sheeran with MySQL AB provided permission to use this previous published case on November 05, 2006. The case was first published January 1, 2004 (www.mysql.com/why-mysql/case-studies/mysql-cox-casestudy.pdf). Mark Cotner was contacted by email about the case. This case study was posted at DSSResources.COM on Friday, March 23, 2007. A July 9, 2003 press release from MySQL AB announced that Cox Communications (NYSE: COX) was using the MySQL� database to run a major data warehousing enterprise application. Check http://www.mysql.com/news-and-events/press-release/release_2003_21.html , view local copy.